What are Google Quick Answers and how to rank for them? That’s a whole host of noise that is competing for the same screen space as you, even if you are ranked position 1 for Organic results. Crafting a strong Page Title and Meta Description can definitely help bring some of that attention to you, but it usually isn’t enough. There’s simply too much noise because of the maps, images and product listings. So you end up pulling your hair out, trying to work out how to increase your Click Through Rate and the overall visibility of your site in the results. We’ve seen this so many times, and completely understand the frustration it can cause! You’ve spent so much time building up your SEO, rising to the top of the mountain, only to find that you’re still not getting the share of the pie that you expected. But there is one more trick you should be trying! Google Quick Answers are answer boxes that Google puts in ranking position zero. This is always above the rest of the Organic results. However, they can also show below some of the highest paying Google ads. When a search result shows a Quick Answer, it will draw a large amount of the clicks away from the rest of the 10 organic results that would normally appear in Google’s Organic ranking. This is because the Quick Answer tries to directly resolve the search query. From this, you can understand that Google Quick Answers (GQA) are very important for gaining a high ranking in search results. STAT has been collecting data since January 2016 to understand how often these position zero answer boxes appear in search results. They have tested a million different keywords to get an accurate idea of the frequency of GQA. The latest data they have posted on their website is from April 2017. They state that 23.25% of results showed a Google Quick Answer in position zero. There are three types of format when it comes to Google Quick Answers; paragraph, list and table. Paragraphs are the most common Quick Answer to appear. A huge 60% of the 23.25% of GQA were paragraphs. 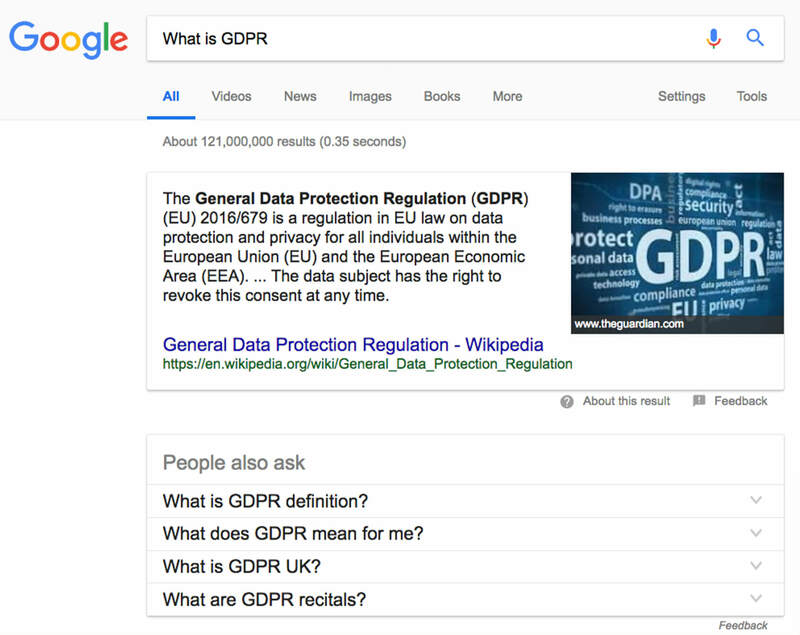 We performed a search for “What is GDPR” and you can see that Investopedia is ranking position zero. The featured snippet has got an image that appears on the right-hand side on Desktop or on top of the text for Mobile. The snippets try to give you a brief answer to your question. This answer is probably not enough to satisfy the question, but it will entice the user to click the link because they already have an idea of what the page will show them. The answer is longer than a meta description and the text is also larger. This will increase the chance of a higher click-through rate. The second most common featured snippet is the list answer box. STAT state that 29% of Google Quick Answers show as a list. 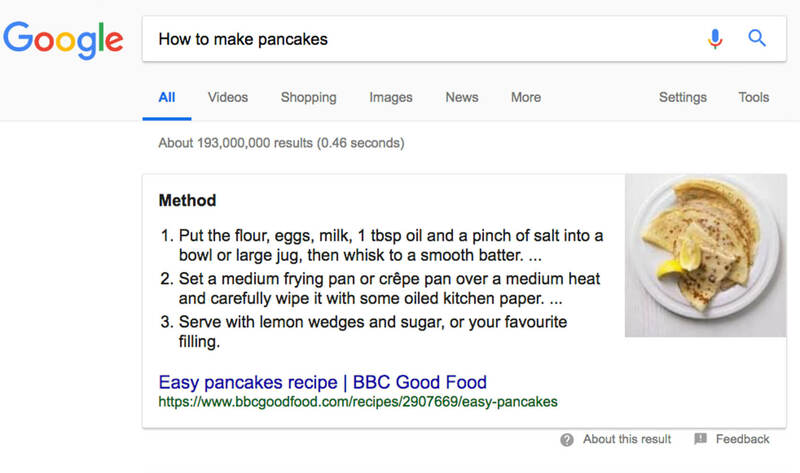 When we searched for “how to make pancakes”, the image on the left appears again and the link to the website is for BBC Good Food. It shows you all the steps to make the pancakes. These lists are usually in numeric format, but they can be listed in bullet points, so either one can appear. In this case, we know if we were to click on the position zero link, a recipe to make pancakes will definitely appear. This is very reassuring for the user because it means no time needs to be wasted on searching through Google for the right answer. The last type of featured snippet format is Table. Only 11% of Google Quick Answer results showed using the table format. 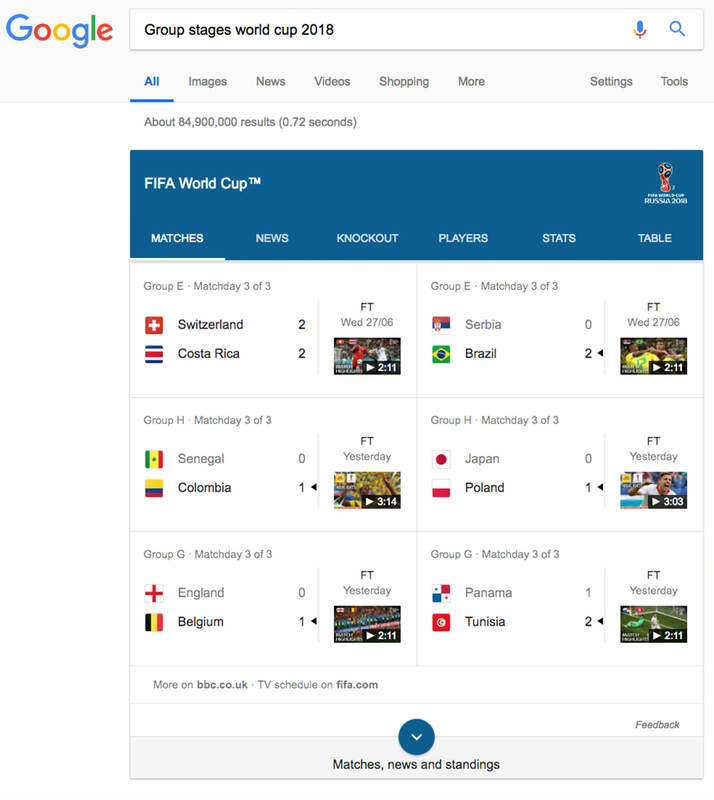 In this example, we searched for “group stages World Cup”. Tables tend to show up during a comparison or a chart-type of view. In this case, match scores and previews were shown with a link to BBC.co.uk and FIFA.com. This Google Answer also showed tabs for more information about the FIFA world cup. This answer would probably see most clicks going to the link instead of the other 10 organic results. How to rank for Google Quick Answers? As mentioned, Google Quick Answers will entice users to click on the link instead of looking through Organic Search Results. So, this is very important for SEO because being in position zero will increase click-through rate and this will create a positive impact on the website’s overall Organic listings (Google looks at CTR as one of their ranking factors). Ranking for Google Answer Boxes is very similar to ranking for Rankbrain. To get to position zero, the content on the page needs to be relevant to the search query. Therefore, writing blog posts for specific queries will be extremely beneficial for this, in the hope that RankBrain will show the content for a relevant query. The best way to choose what key phrases to write content for, in the hope of qualifying for Google Quick Answers, would be targeting key phrases that already have a website ranking at position zero. This is because it means that key phrase can definitely rank for Google Answer Boxes. Also, an assessment of the competitors content can be done to then create better content than them. If possible, clearly write a how-to… list, including the phrase “how to…” in the content and bullet points that clearly presents answers. This way, the post is not just written to qualify for a paragraph quick answer. Techincal Optimisation tactics and theme-relevant cross-linking will massively help to boost the content up the Google Rankings. Do you need help getting to Position Zero on Google? We understand that writing out-ranking content isn’t as easy as it sounds and the SEO industry seems to be evolving by the day. That is why we are here, to get websites to the top of Googles Organic Rank. If you’re thinking of implementing an SEO strategy for your website, our Search Engine Marketing team would be more than happy to help. Find out more here, or feel free to contact us on tel: 0845 544 3626. I'm Kieran, I am a Search Engine Marketing Executive at Brave Agency. I basically live in Google Analytics and Google Adwords, analysing the data and fixing the issues on websites and campaigns. I have a huge focus on getting the best ROI out of everything that I do and love to keep up to date on the latest and greatest SEO and PPC changes, technical advancements and algorithms.